The FIre Service Role in Emergency Medical Services - introduction and story below. 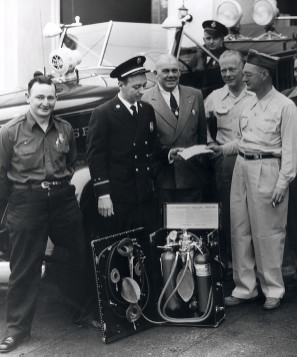 Larkspur Fire Chief John Raggio accepts a donation of an emergency medical resuscitator from the Larkspur Lions Club in the early 1950's. Photo courtesy of Larkspur Association of Volunteer Firefighters. This page will eventually feature the story of the evolution of emergency medical services as provided by fire departments in Marin County. From basic first aid and rescue, to the sophisticated paramedic, rescue and ambulance services of today. 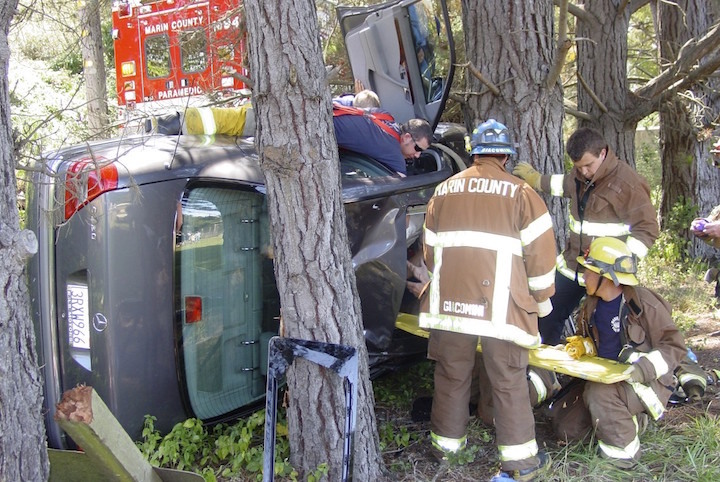 The Marin County FD works to extricate patients from a vehicle crashed off the side of a rural road in West Marin. Photo courtesy of MCFD. An early Marin County FD Ambulance at work. Photo courtesy of MCFD. by Tom Forster, originally a series of "Inside the Fire House columns featured in Plumas News, Quincy, California. Why does your local fire department respond if you need emergency medical care? Why do they usually come with a fire engine in addition to the ambulance? Ever wonder what the role of an “EMT” is? How about an “Emergency Medical Responder”? And what about a “Paramedic”? How do our local firefighters fit into these roles in Marin County history? And, perhaps the most important question, why is your local fire department even providing this service? Fire service roots in providing emergency medical aid go very deep, and can be traced at least as far back as the middle ages. The Knights of Malta became a charitable, non-military organization during the 11th and 12th centuries, providing aid to the sick and poor, and helping to set up numerous hospitals. They would later join the Knights of the Crusades in battles to win back the Holy Land. They wore crimson-colored capes over suits of armor. This provided a defense against fire, one of the newest weapons of war. As invading forces attacked a castle, for example, the defenders would throw down containers of naphtha and other flammable liquids from above. Once the attackers were soaked, a torch would be hurled down, igniting the fuel-soaked clothing. With their fellow troops then on fire, the Knights of Malta would approach on horseback, rip off their capes, and use them to extinguish the flames. ​As a reward for their bravery, the Maltese cross worn by the Knights was decorated and inscribed by admirers. It came to be known as one of the most honorable badges for a uniform. The legend of the Maltese cross grew as it became associated with the qualities of loyalty, bravery and defender of the weak. Today, firefighters across the country often wear versions of the Maltese cross on their uniforms and apparatus. 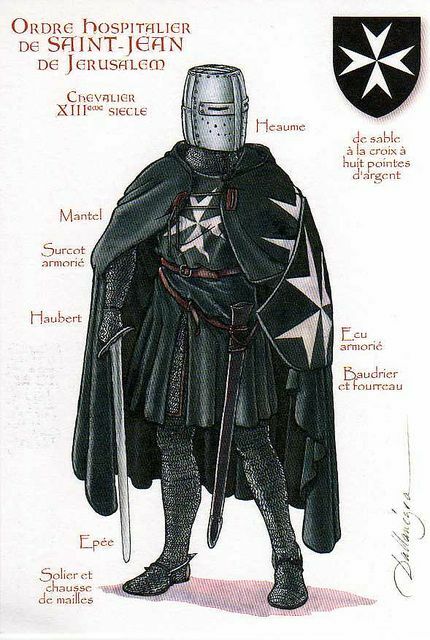 A related group was known as the Knights Hospitaller, with links to an ancient hospital system. Space limitations here prevent a more detailed description, but those interested can easily find more information on the Internet, and in your local library. 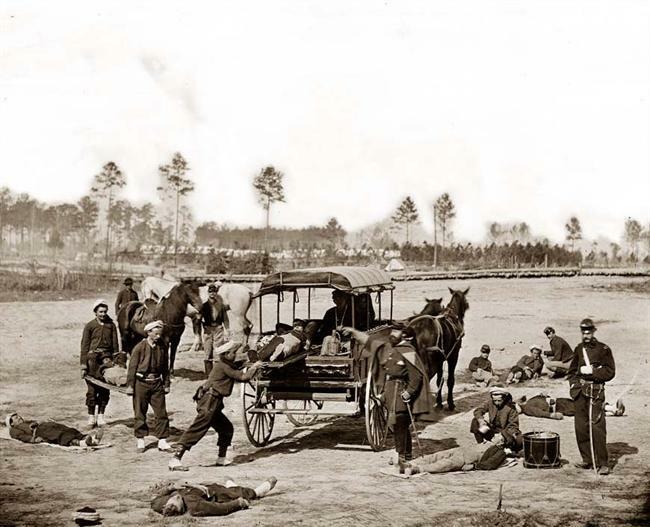 The involvement of the American fire service in field medical care or transport can be traced far back in American history, including in the Civil War over 150 years ago. 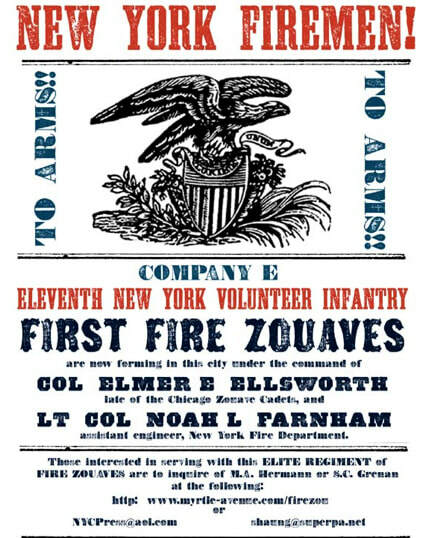 It was common for volunteer firefighters of the day to enlist in the Armies of the north and south forming groups of soldiers often known as Fire Zouaves. For example, the Battle of Gettysburg memorials recognize among others the 73rd New York Volunteer Infantry Regiment, or “2nd Fire Zouaves." The monument includes a statue of a firefighter standing next to a soldier, with the motto “Firefighters in Peace, Soldiers in War.” While they were not alone in doing so, Fire Zouaves operated field ambulances. Prior to 1970, attendants with basic or advanced first aid training typically staffed ambulances in America. Often they were volunteer firefighters. Sometimes the ambulances were privately owned, or served through hospitals, and sometimes they were staffed by fire departments or specialized rescue squads. Fire departments typically focused on fighting fires, but often provided some limited first aid and rescue services. There were, and still are, some volunteer groups that just do EMS. As urban areas expanded in the industrial revolution, private industry began to operate many medical ambulance services, when there was enough volume to make it profitable. Rural and poor areas where the need was less frequent often did so through volunteer fire departments, or specialized rescue squads. 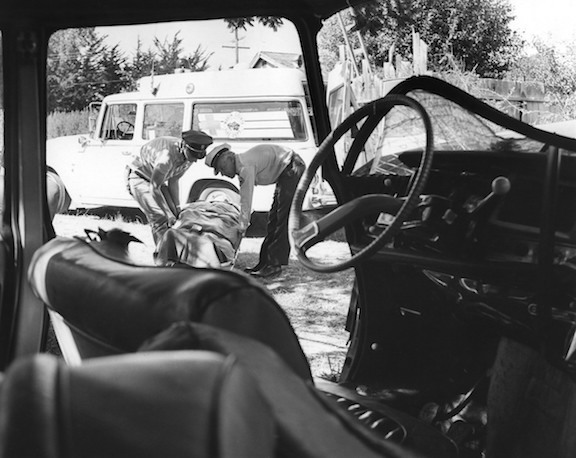 In Marin County, several local fire departments started providing ambulance transport services during the 1950's. This included for example, the Sausalito and Marin County fire departments. Volunteer firefighters, and eventually paid staff, then typically called “firemen”, manned the units when needed. By the 1960’s, the experiences of treating wounded soldiers in Korea and Vietnam led researchers to study trauma survival rates, based on emergency care. To their surprise, they found that soldiers who were seriously wounded in Vietnam had a better survival rate than citizens who were injured in vehicle accidents on California freeways and highways. There had been a tremendous expansion in the highway and freeway systems in America starting in the 1930's. This problem was linked to a number of factors, including the use of a new type of medical corpsman in Vietnam, trained to perform some advanced procedures, such as airway management, and fluid replacement. The report, published in 1966 by the National Academy of Sciences, was titled “Accidental Death and Disability: The Neglected Disease of Modern Society.” Also in 1966, Congress passed legislation creating the National Highway Traffic Safety Administration (NHTSA), which birthed the first federal standards for Emergency Medical Services (EMS). By 1967, several large urban areas were developing advanced field emergency medical care programs using firefighters, including Miami, Seattle, Los Angeles, and Pittsburgh. Pittsburg’s Peter Safar is considered the father of Cardio-Pulmonary Resuscitation (CPR). He began training unemployed African-American men in 1967 to serve in what became the Freedom House Ambulance Service, the first civilian or local government “Paramedics” in the U.S. They had a more advanced form of training similar to what the Army field medics received. The first Los Angeles County Fire Rescue unit, Squad 59, officially went into service on December 8, 1969 with two newly trained Paramedic. This eventually led to an idea from producer Jack Webb to feature FD paramedics in a television show. When the show “Emergency” first aired in 1972, there were only three pilot paramedic programs operating in America. By the time the show ended in 1977, there were paramedics operating in every state in the nation. California was the first state to adopt legislation in 1970 defining paramedic “certification” to provide advanced medical life support, when then Governor Ronald Reagan signed into law the Wedworth-Townsend Paramedic Act. Why the link to fire departments (FD’s) providing this service? Part of the ‘lessons learned’ in Vietnam included the importance of rapid care and transport. Also, emergency medical care incidents in the field sometimes occur with rescue or extrication complications. For example, home fires, car wrecks, and other incidents may first require victims be removed from further danger. Fire Departments can often get there the quickest, and also have the specialized rescue training, personal protective clothing, and equipment for extrication. In Part I we described the roots of fire service involvement in providing emergency medical care (EMS) in the field, also known as the ‘pre-hospital setting’. While the fire service is one of several types of organizations that provide emergency medical care, for the purposes of this history feature we are focusing on the FD link. EMS incidents usually rank today as the largest component of FD emergency responses each year, rather than fires. Nationally, many consider the publication of the National Academy of Sciences report in 1966 titled “Accidental Death and Disability: The Neglected Disease of Modern Society” to be the beginning what has become modern Emergency Medical Care, or EMS. The report identified accidental injuries as “…the leading cause of death in the first half of life’s span,” revealing that in 1965 alone, more Americans died in automobile accidents than died in the entire Korean War. 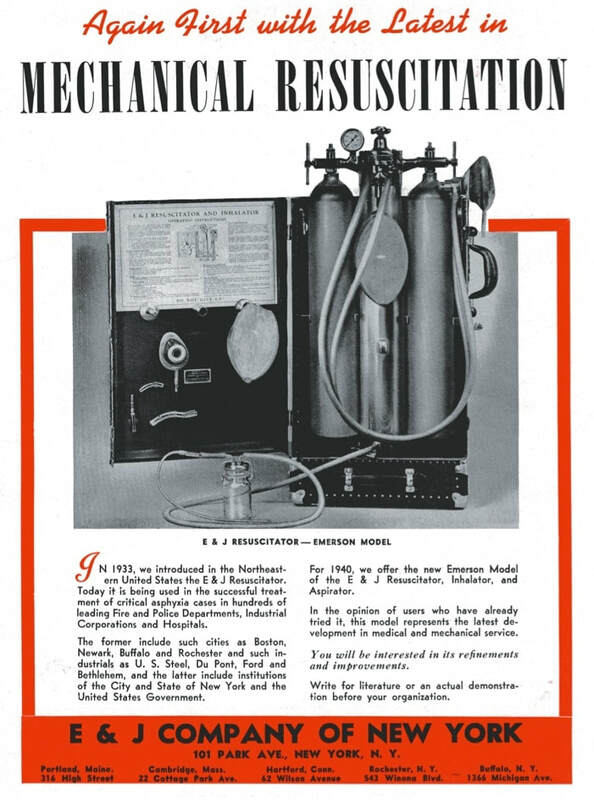 What became known as “The White Paper” indicated that, outside of the hospital setting, “…if seriously wounded…chances of survival would be better in the zone of combat than on the average city street.” The lack of regulations or standards for ambulance operations, and any standards for provider training was cited as one of the main reasons for that reality. Several recommendations for the prevention and management of accidental injuries were made, including the standardization of emergency training for “rescue squad personnel, policemen, firemen and ambulance attendants.” This led to the first nationally recognized and standardized curriculum for EMS, Emergency Medical Technician–Ambulance (EMT-A), published in 1969. Ever since then, a greatly improved EMS system has evolved, improving survival cahnces through a chain of actions that starts hopefully with prevention and safety programs, but may end up with care in a hospital emergency room. 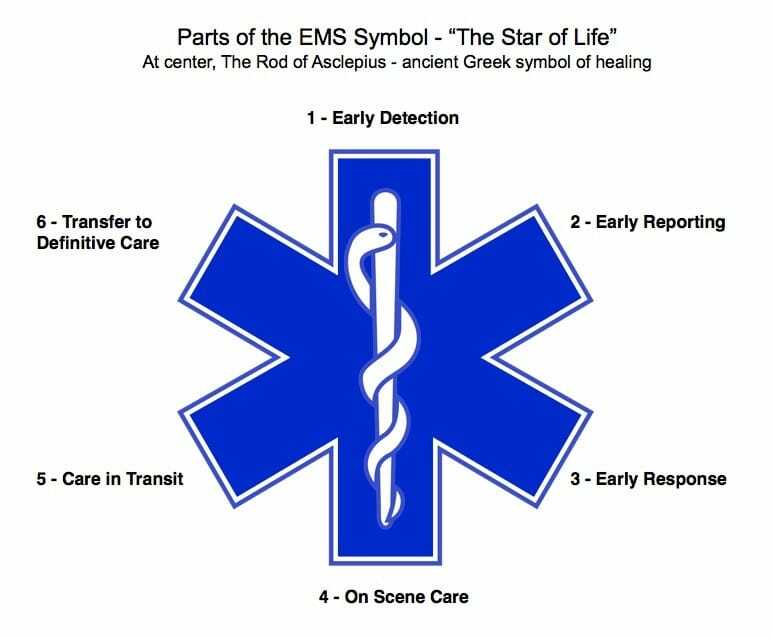 In between, the blue and white, six-pointed EMS symbol called “the Star of Life” best illustrates the ideal components. It was originally designed by the U.S. National Highway Traffic Safety Administration (NHTSA). Traditionally the logo is used as a stamp of identification for ambulances, paramedics, or other personnel such as firefighters trained in EMS. See the illustration accompanying this article for the six parts of EMS. Local FD’s are usually involved in the parts of the Star of Life illustration above in part three (early response) and part four (on scene care), and sometimes in parts five (care in transit) and six (transfer to definitive care). The licensing of EMS personnel and services occurs at the state level and, for some certifications, at the local level. Each state can add or subtract levels as they see fit for their needs. The federal government identifies a model scope of practice, including minimum skills for Emergency Medical Responders (EMR’s), Emergency Medical Technicians (EMT’s), Advanced EMTs and Paramedics. In California, there are generally five levels of certification: 1) EMR’s, with a minimum of 40 hours of training; 2) EMT’s, with a minimum of 120 hours of training including some clinical time; 3) Advanced EMT’s (AEMT’s), with a minimum of 88 more hours of training; 4) Paramedics, with an average of 1100 hours of training including much clinical time; and 4) Mobile Intensive Care Nurses (MICN’s), or Registered Nurses who have completed additional training in pre-hospital care and often serve in critical care roles such as air transport. Not all counties offer or support all of these levels of certification. While states are able to set their own additional requirements for state certification, a quasi-national certification group exists in the National Registry of Emergency Medical Technicians (NREMT). The NREMT offers national certification based on the NHTSA National Standard Curriculum for the levels of EMR, EMT, Advanced EMT and Paramedic. There have been many people who have made contributions to the growth of modern EMS in Marin County. In the next installment of this feature, we’ll look closer at some of the key players and groups, including identifying the first FD Paramedic program in Marin.